This article is about squirrels in your attic. If your problem is with squirrels in your yard, then read this article How to Get Rid of Squirrels. Sooner or later just about every home owner will have to deal with the issue of squirrels in the attic. You hear squirrel noises like the pitter patter of little feet overhead, and it’s actually just that, only maybe 12 or 14 or 16 feet, not just two. Scratching and scurrying noises will be most common in the early morning when the mother squirrel goes out for food and water, but they can occur 24 hours a day, especially if another rodent, like a rat, is also in your attic and threatens the squirrel. The more work you have done on your attic, the more finished your attic, the louder the sounds will be in the rest of your home. 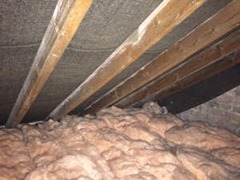 Mother squirrels look for safe places to have their babies, and a soft nest of insulation inside your weather-proof, predator-proof attic is prime real estate for their nursery. If you don’t do any rodent control at all, the baby squirrels will go to have their own babies in your attic, until it becomes a chewed-up latrine that not even a rodent would call home. Squirrels are a potentially costly pest, capable of gnawing through wood and dry wall and just about anything that isn’t metal in the frame of your house. To keep their teeth sharp (sharp enough to bite you, you need to know) they will also wander about your property gnawing on wood siding, roofing shingles, doors, barns, tool sheds, patio furniture, grill covers, plastic yard lights, and non-metal parts of parked cars. Despite the damage these pestiferous critters may cause, you want to be kind to them –if only so their babies don’t die and leave a lingering odor in your house. How Do Squirrels Get In Your Attic? A mother squirrel will not ring your doorbell and politely ask “Would you be so kind as to lower your attic access door so I may come in and give birth?” Twice a year, usually in spring and fall, female squirrels mate and become pregnant. As their due date approaches, they look for safe hideaways where they can bear and raise their young. Sometimes the squirrel’s front door is built into your house. Roof vents, fascia boards, roof-soffit joints (places where two roofs meet), gable vents, wall vents, sewer gas vents on your roof, and uncapped chimneys need to be pest-proof. If they aren’t, Mrs. Squirrel can come and go without using her powerful teeth. Sometimes the squirrel highway is a natural result of the aging of your house. Rotten fiberboard is a prime target. Plumbing mats around roof vents can shrink. Soffit joints can pull apart. Chimney pipes move as the foundation of your house settles. You simply need to get up on your roof, or have someone get up on your roof, every two or three years for preventive maintenance. Desperate squirrels, however, will make their own doors to their attic. You may notice tooth marks around the perimeter of your roof or at an attic door. It’s natural to want to close off rodent access to your attic, but don’t. It’s fine to repair all but one entry for the squirrel to your attic, but you want to leave the squirrel’s main passageway open until you trap her and her babies. Why Don’t I Want to Lock the Mother Squirrel Out of My House? By the time you notice a mama squirrel going in and out of your attic, chances are a litter of baby squirrels is hidden inside. It’s inhumane to separate helpless baby rodents from their mother. And they will get even with you by dying and stinking up your house for weeks. Even if you succeed in ridding your attic of the entire family of squirrels, mother and pups, you still need to clean out their feces and urine and the bacteria that thrive on them, so you don’t breathe in those bacteria later. Wouldn’t Poisoning Squirrels Work Better? For the same reason you don’t want just to lock the mother squirrel out of your attic, you don’t want to put out poison either. First of all, what’s poisonous to squirrels is also usually poisonous to people. It takes a lower dose to kill a squirrel than it takes to kill an adult, but rodenticides can be especially toxic to infants and children. Also, even poisoned squirrels decay and generate a really bad smell. Squirrel poison kills squirrels, not the parasites and microbes their bodies harbor. You have just as much cleanup work to do if you poison the squirrel as if you take a more humane and effective approach. Electronic squirrel repellents irritate the squirrels and are designed to make them leave voluntarily. These work best in your attics which are not full of clutter because the clutter will reduce the effectiveness by blocking/deflecting the sound waves. However, if you have a clutter-free loft, this is the easiest method. A good way to get rid of squirrels in your roof or attic forever is to trap and remove them by hand. The very first thing to keep in mind about removing squirrels by hand is that the directions should tell you “by gloved hand.” Squirrels bite. They may look cute and cuddly and pet-able, but they can deliver a nasty bite. Trap the mother, and then remove both mother and pups to a location outside your attic but where the mother can find them, usually within 50 feet/16 meters of your home. What Kind of Squirrel Trap Works Best? Two-door squirrel cage traps used with the best squirrel bait works extremely well. After you’ve trapped them, you remove them and seal up the hole. Read this article How to Bait a Squirrel Trap. One-way exclusion doors let the mother squirrel exit but do not let her return. This method only works if you have sealed all but one entrance (usually the entrance with the most tooth marks) to your attic, and installed the one-way exclusion door there. After you exclude the mother squirrel, you still need to go into the attic and remove the babies. You could kill the baby squirrels, of course, if your local laws permit you. However, you could also transport the nest (with gloved hands, to avoid contact with bacteria and to avoid leaving your scent on them) to a relatively safe location that could be found by the mother. Then seal the hole where you placed the one-way exclusion door with steel so the mother and future squirrels can’t come back in. Don’t seal the hole until you are sure all of the squirrels in your attic have been trapped. Roof-mounted cage traps lure squirrels with the scent of peanut butter (you have to apply the bait yourself) into a one-way exit. Like exclusion doors, they only work when you have sealed all but one entrance to your attic. Then the trap will catch any squirrels as they exit. Repeater traps catch them one by one until you know your attic is clear (by inspecting your attic, not the trap). You won’t have to wonder where the mother and pups have gone. If you have waited a few weeks to deal with your squirrel problem, this is a better approach, since it captures both the mother and any of the young who are capable of leaving the nest behind her. Simply make sure all the squirrels that were in your attic are in the trap, take the squirrels to a new home, and close the hole with steel so they can’t come back. Choosing the right trap is critical. If it’s too small, the squirrel won’t fit inside, and it will go back into your attic. If the trap is too large, the squirrel may not step on the trip pan to lock itself inside, or it may start running back and forth inside the trap and injure itself. For most tree squirrels, a 16 x 4 x 4 inch (40 x 10 x 10 cm) trap is ideal. Lethal-grip traps kill squirrels as they step into the trap. (A rat snap trap won’t work.) However, you run into the same problems with kill traps as you do with poison. You still have to remove any babies that can’t leave the nest. 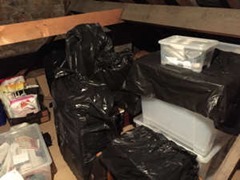 There are quick fixes for rodent problems that work in the inhabited parts of your house or apartment reasonably well that just won’t work in your attic. Mothballs will keep silverfish out of your clothes and books, and may keep squirrels out of your flower beds, but they won’t separate mother and offspring. Coyote urine and ammonia may keep you out of your attic, but they won’t deter a mother squirrel. And there is no shortcut to home hygiene even after successful squirrel removal. Whoever removes the squirrels from your attic, however, you still need to clean up. In parts of North America and Europe, including California, up to 80 percent of squirrels carry the parasite that causes Lyme disease. In Africa, there are exotic parasitic infections that can be carried by squirrels. In Latin America, squirrels can carry Chagas, a potentially fatal infection of the heart and gastrointestinal tract. And there are a variety of stomach upset and skin lesion diseases that can be lurking in the litter even after the squirrels are gone. Your individual risk of catching one of these diseases from a squirrel is low, but you still need to fog your attic to get rid of germs after you get rid of squirrels. Wearing a face mask, vacuum up any squirrel droppings and remove dead squirrels by gloved hand. Still wearing a face mask, remove any larger chunks of feces by gloved hand. This is important for preventing roundworm infections. Finally, fog the whole attic with an antimicrobial product. You can’t easily remove dried urine, squirrel pheromones, fleas, and ticks. You need to kill parasites and pathogens with an enzymatic, antiseptic fogger, and to wear both breathing and body protection while you do it. Discover how to get rid of squirrels. This article will provide you with enough tips and tricks to banish any squirrel problem permantly. Red squirrels are eye-catchingly red. They are stunning beautiful animals. Unfortunately, they are an endangered species, mainly due to the introduction of gray squirrels, which carry diseases which the red squirrels have no protection against. To get rid of squirrels naturally you have to think like a squirrel. We describe squirrels behaviors, likes and dislikes in this article. Knowing how squirrels operate will help you choose the best natural deterrent for your given situation. 10 great tips to help with squirrel pest control. There are some obvious ones and others which may have never occurred to you. 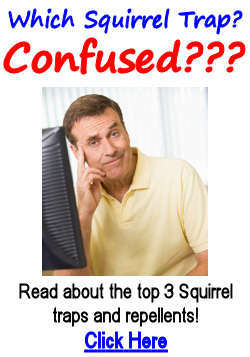 Read more and expand your knowledge on getting rid of squirrels. Baiting a squirrel trap is easy when you know what you are doing. Here are eight simple rules, apply them and achieve success. Simon Mann is a "handy man" to have around the house. Although he was a trained carpenter he went on to become a VP of a construction company. Any pest or DIY problem you may have, he always seems to come up with the right solution. It might have some effect, but I would use it together with other methods like an ultrasonic repellent.